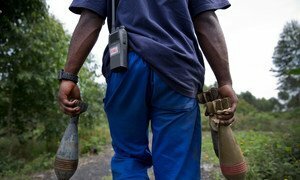 A member of the UN Mine Action Service (UNMAS) clears the UN base outside Juba, South Sudan, of unexploded ordnance (UXO’s) in the aftermath of heavy clashes. UXO are comprised of bombs, mortars, grenades or other devices that fail to detonate but remain volatile and can kill if touched or moved. On the day set aside to raise awareness about the threat of landmines, unexploded grenades and other munitions that impede the return to normal life after conflict, United Nations Secretary-General António Guterres is urging Governments to provide political and financial support to keep up the vital work of mine action wherever it is needed. “An unprecedented volume of landmines and unexploded weapons contaminates rural and urban war zones, maiming and killing innocent civilians long after conflict has ended,” Mr. Guterres said in his message on International Mine Awareness Day, marked annually on 4 April. “And when fields are cleared and schools and hospitals are made safe, normal life can resume,” he added. According to the UN Mine Action Service, or UNMAS, after nearly two decades of steadily diminishing casualty rates, the total number of people killed or injured by landmines and other explosive hazards in recent and current intense conflicts has leapt to its highest since 1999; the human suffering caused by mines, explosive remnants of war and other explosive hazards, including roadside bombs or booby traps, is devastating. Mine action, including clearance, risk education and assistance to victims is critical for advancing protection, peace and development. “In our turbulent world, mine action is a concrete step towards peace,” stated the Secretary-General. Most places affected by armed conflicts are contaminated by a variety of explosive hazards, said Daniel Craig, the UN Global Advocate for the Elimination of Mines and Explosive Hazards. Mr. Craig, best known for his role as ‘007’ in the James Bond films, outlined how mines curtail freedom – the freedom to play, collect food and water, farm and even vote. “Join me. Join us. Let’s win,” said Mr. Craig. A live demonstration and discussion on the technical aspects and impacts of IEDs will wrap up the commemoration on Thursday, 5 April. As the world marks the tenth anniversary of the passing of the global mine ban treaty and commemorates International Mine Awareness Day, the head of the United Nations’ office dealing with the threat they pose stressed today the importance of looking beyond the effects of just anti-personnel mines.